TBI | When I Survey . . .
I’d like to thank you for inviting me to be with you today. I have great respect for ministry as a high and holy calling, and I enjoy the company of ministers. 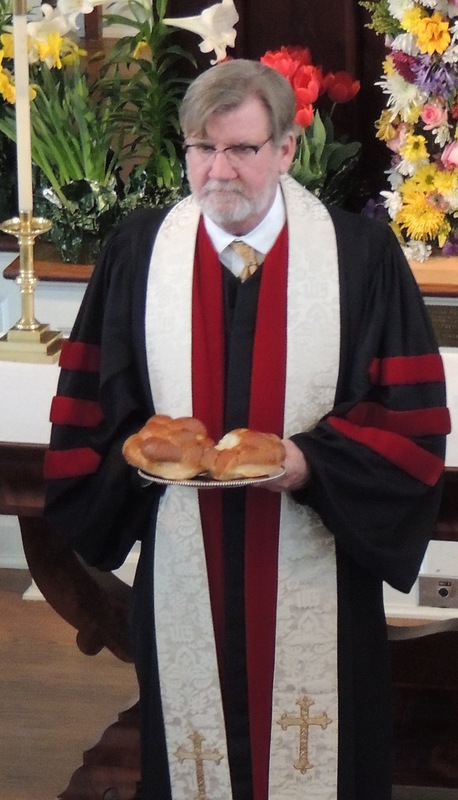 I am proud to be a minister, and this year is the 40th anniversary of my ordination. And it is good to be in the Connecticut Conference. I never served here, but my daughter, Rebecca Floyd Marshall, is an ordained minister here in CT, serving in Westport. If you bump into her at a Conference meeting introduce yourself. My talk today is entitled “Taking the Long View” which was the title of a UCC STILL SPEAKING Daily Devotional I wrote for March 14 of last year. I see it was re-printed in your newsletter. I’m going to share with you some of my personal back-story behind the writing of this particular devotional. I have a brain injury. It is one of the bald facts of my life like being tall or having brown hair. Unlike those facts though, I was not born with a brain injury, but acquired it on August 5, 2000 (see “I Lost My Marbles on the Mohawk Trail”). In my life story that day is a dividing marker. There is the time before my injury and the time after my injury, just as ancient Israel divided its life into before and after the fall of Jerusalem and the Babylonian Exile. I honestly don’t ask that question about my accident. I don’t feel guilty about my brain injury. Some things in life just happen that we are powerless to do anything about, and I believe this was one of those things. I don’t believe God throws people off bicycles. And I’m not ashamed about my brain injury, although it has taken me awhile to deal with the strange reactions of many people to my disability. I bump into people in the grocery store, and they ask me if I am feeling better, and I smile and say I am doing OK, which I am. But the real answer in regard to my brain injury is “no.” I’m not better and, like Humpty Dumpty, I’m not going to be put together again. The task for me is to take care of myself and adjust to my disability from day to day as best I can with a lot of help from my family and my professional caregivers. So it is what it is. I sometimes grieve for the life I expected to have. I am sometimes sad because I miss my ministry and the purpose and meaning that came with it. But I am unable to do it anymore and that is that. I am grateful for the thirty years I had to do it. I am grateful for my wife and children and family and friends. I am grateful I still have speech and memory, and the cognitive capacities to write and imagine. And I am one of the lucky ones. Of the roughly 1.4 million who sustain a Traumatic Brain Injury (TBI) each year in the United States 50,000 will die. One of the reason I choose to speak openly about my TBI is there are many of our neighbors out there who have TBI and they are struggling. The CDC estimates over 3 million Americans have a long-term or lifelong need for help to perform their daily activities because of a TBI. And there will be more. Many returning veterans have TBI from concussive injuries. Many of these heroes will daily struggle to manage stress, control their tempers, solve problems, and deal with life’s emotional issues. Many will have difficulty finding and keeping a job. Many will be unable to work. I am glad that Gary Trudeau has created a sympathetic character with TBI for his Doonesbury comic strip. The more people know about TBI the better. One of the reasons for better education is that many people with TBI go undiagnosed. Many of these will self-medicate with drugs and alcohol. Untreated and unsupported such people with TBI will have very tough lives, and so will their family and friends. So I choose to talk and write about brain injury so that more people can know about it, and can seek the support they need. There is support and services for people with TBI. I have been helped by the Massachusetts State Head Injury Program (SHIP). Massachusetts has an active Brain Injury Association, as do other states, and there is a National Brain Injury Association with a good website. I was recently driving on the highway and saw a billboard from the Brain Injury Association. It pictured a camouflaged helmet, the kind our troops wear in Iraq and Afghanistan. The sign said: “You can’t camouflage a brain injury!” It’s really time we stopped trying to do that. When my kids were toddlers such spills were commonplace at our table, and we did our best to be patient. “Don’t cry over spilled milk” is part of every parent’s lexicon. The word spill means “to cause or allow (a substance) to run or fall out of a container.” By extension it came to mean to fall. Last summer I had a spill and went over the handlebars of my road bicycle. As a result of that spill, I separated my right shoulder, broke a rib, and sustained a traumatic brain injury that left my wits addled for a number of months. Because of my separated shoulder the first few times I tried to pour juice or put milk on my cereal I spilled it all over the kitchen counter. It gave me new empathy with what my children were facing as toddlers. Life is a series of spills. Like Henry, we do it all the time. We run or fall out of our container, and it makes a mess that we then have to clean up or fix. The conventional wisdom is to not cry over spilled milk, and to pick yourself up after a spill, and I think from a human point of view that is exactly what one should do. So I plan to get back on my bicycle as soon as it, and I, are ready, whenever that is. And so human life is a series of spills and perhaps God does cry over our spills, not over spilled milk, but the kind of wasteful spills that we know, relationships gone sour, talent squandered, potential wasted and the fearsome losses of war. The Christian answer is not then just to pick yourself up, because the truth is we can’t pick ourselves up. There are spills you can fix, be they milk on the counter, or the bruises and fractures of a fall from a bike, but there are spills from which we never recover. We are close to the heart of things in these gestures, when we can realize that in Christ God pours out his own life, that we might have life, and have it fully. That’s a great paradox: human life spills, but God fills, spilling his life so that we might have life and have it in abundance; giving us his life-giving Spirit even as we fall out of our containers and face the potential and sometimes very real emptiness of being human. We can’t fill our own containers, only God can do that. He’s made us to be filled, and “our hearts are restless until we find rest in Thee,” until we realize we cannot do it ourselves, only God can. Henry only becomes lovable when he accepts his newfound vulnerability. It’s a hard lesson. Some of us must learn it again and again. And it goes clean contrary to the conventional wisdom of the world, which is that to win you must be strong and tough and self-sufficient, needing nothing or no one. But in fact we do need others and we do need God. Because life is a series of spills, and in them God gives us opportunity to come to terms with our need for him, and to accept the life he gives us as a gift, when we stop trying to manufacture life for ourselves without him. So don’t worry so much about your everyday spills. They are part of life. Hey, I do it all the time. Natasha’s Richardson’s shocking death from a head injury last week after what seemed like a minor fall on the bunny slope of a Canadian ski resort highlights how fragile our brains can be. So wearing a helmet is a good investment in your health. I ride on our local bike path, the Ashuwilticook Rail Trail , quite frequently, and am amazed at how many people ride bicycles without wearing a helmet. Here in Massachusetts there is a law that children must wear them, but I see mom and dad helmet-less while the kids wear them, which sends the message that helmets are for kids. It’s like the parents who drop the kids off for Sunday School but don’t go to church. Children get the message. And people have told me they don’t wear one because they are only on the trail and don’t go very fast, but it only takes a minor bump to do the damage, as Richardson’s injury shows. And though a helmet can’t guarantee that you won’t sustain a TBI, it will likely lessen the impact and resulting damage and disability. We are seeing thousands of cases of TBI from troops returning from Iraq, and the human and social cost of these injuries is profound. TBIs can cause memory loss, focus and attention issues, personality changes, chronic tiredness, severe depression, inability to multitask, sleep problems, and many social problems. A psychiatrist who fell from a ladder and hit his head had to quit his practice. He told me that having a brain injury is “an exercise in patience and humility.” I have found that to be true. So do what you can to avoid getting a TBI. If you ride or ski or participate in any sport where your head is at risk, do yourself and those you love a favor. Wear a helmet.